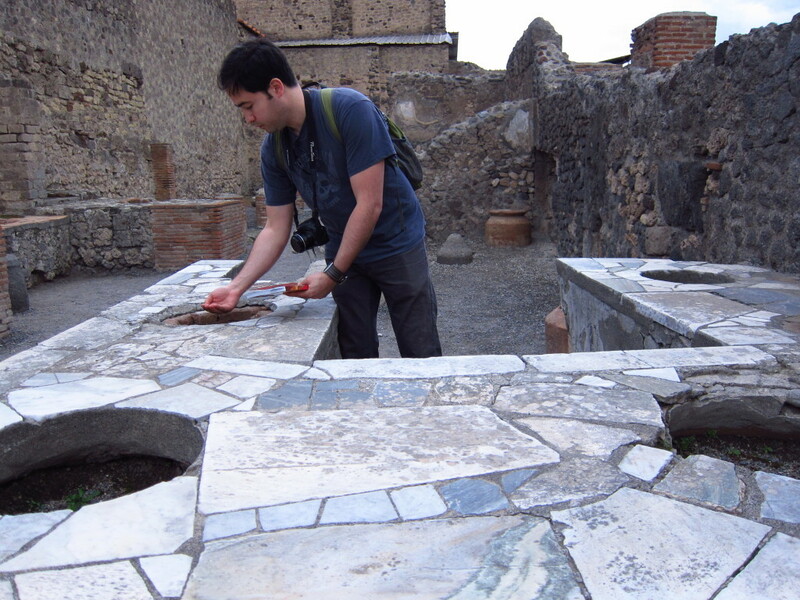 This is really embarrassing, but I didn’t even know the story of Pompeii until we started planning our trip to Italy. 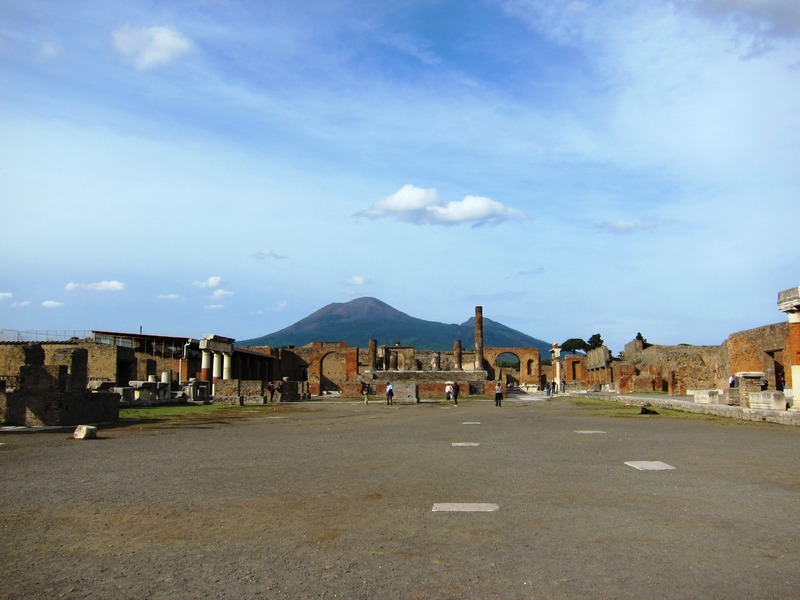 But once I found out what Pompeii is, I really wanted to make it over there. 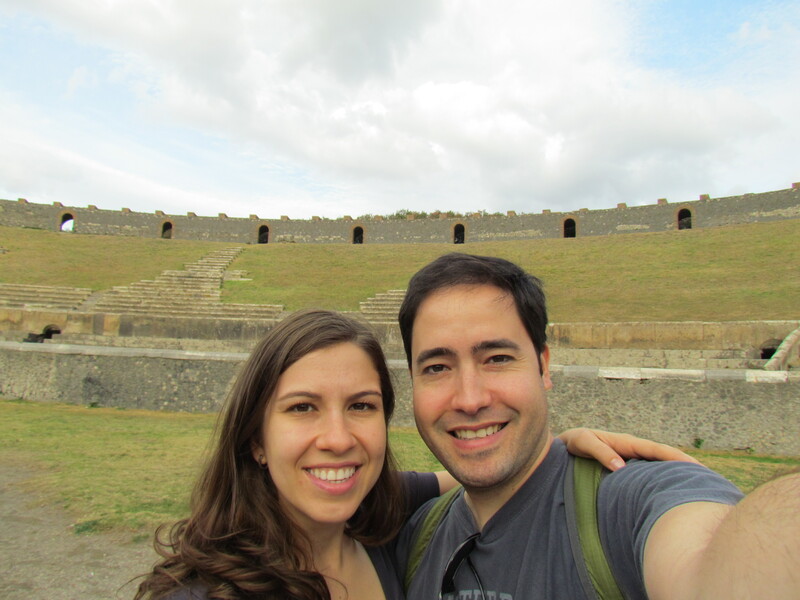 Since we had a few extra days in Rome and Naples, we decided to take a day trip from Naples and go to Pompeii. Ever since we went there, I’ve been reading up on Pompeii. 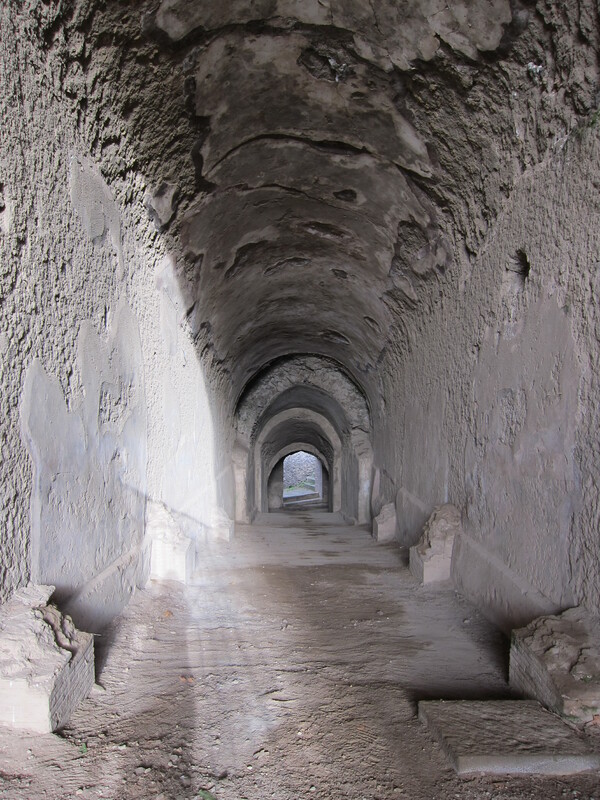 It is pretty amazing that Pompeii was covered 25 meters deep after Mt. Vesuvius erupted. The reason that everything was so well preserved from so long ago is that it was covered by ash and was protected from air and moisture for so long. 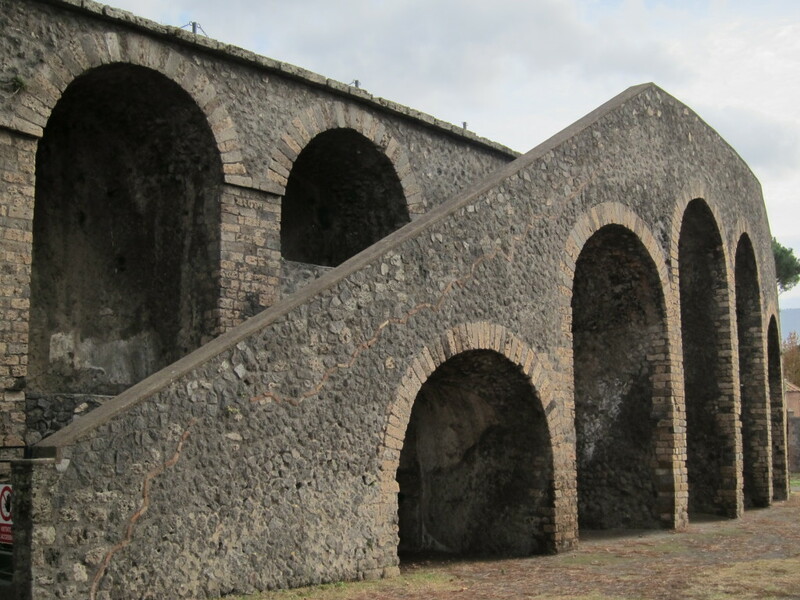 Getting to Pompeii is very easy from the Napoli Centrale station. 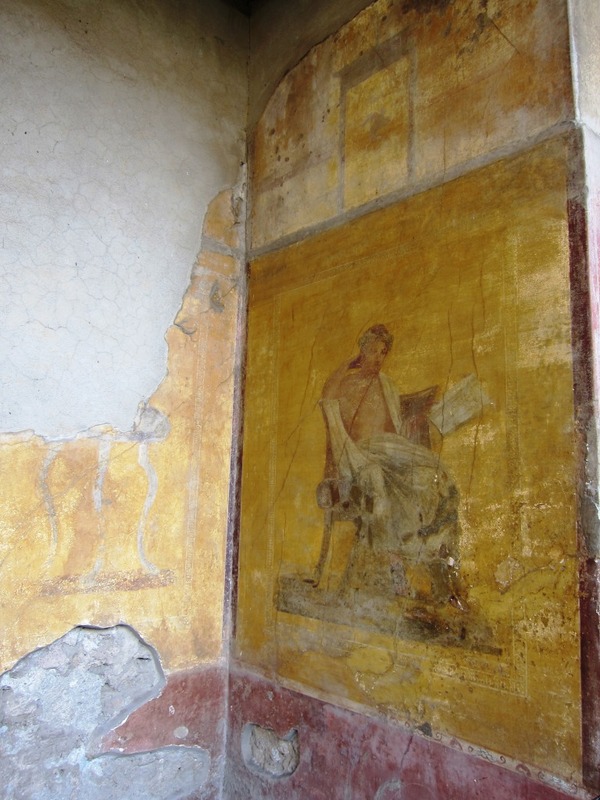 The only tricky part is that there are two train stops in Pompeii – one called Pompeii and one called Pompeii Scavi. You have to make sure to get tickets to the Scavi stop on the Circumvesuviana railway instead of taking TrenItalia to Pompeii. The tickets for the Circumvesuviana railway are sold downstairs in the Napoli Centrale station, right by the entrance to tracks. They were €2.90 each way when we went. Anyway! 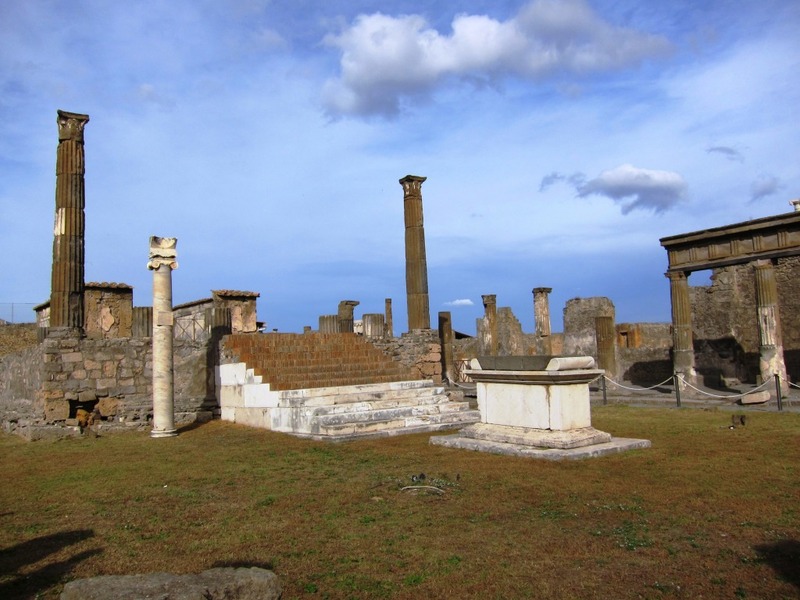 When you get to the Scavi stop, the ruins are a quick 5 minute walk from the train station, you really can’t miss them. 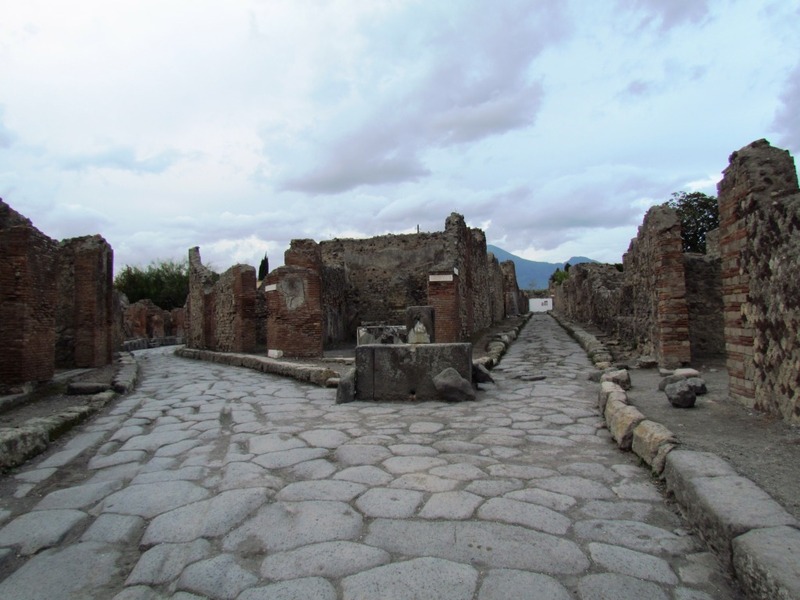 If you end up going to the other Pompeii stop, I believe it is a slightly longer walk to the ruins, you might just have to ask for directions. When we got to the entrance of the ruins, they had a sign by the ticket booth saying they were out of maps. I don’t believe that they just happened to run out of maps, because the sign was laminated and not the kind of sign you put up if you just happened to run out of maps that morning. Besides, maps were somehow magically available with the purchase of an audioguide or a guidebook. 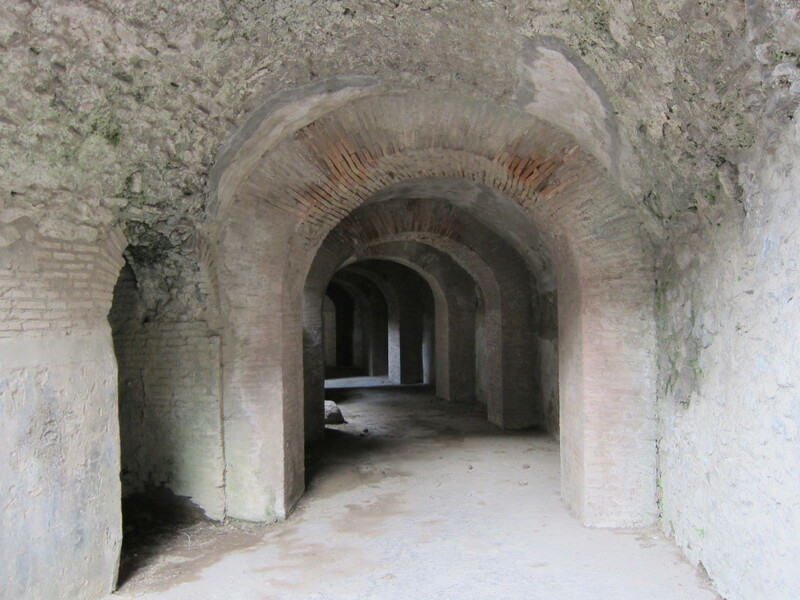 Now, honestly, you do need some kind a map and either a guidebook/information about Pompeii or an audioguide, because there are absolutely no signs or information about anything you’re about to see. We decided to get the guidebook to the site, since it was the same price as two audioguides and we would have something to look back on later. The guidebook was kind of hard to follow since it wasn’t in the same order as the numbers on the map, but it was still pretty useful, since we would have had ZERO information about the site without it. We ate our picnic lunch that we brought with us (frittata sandwiches, fried rice ball, fried mac & cheese patties), and went inside. 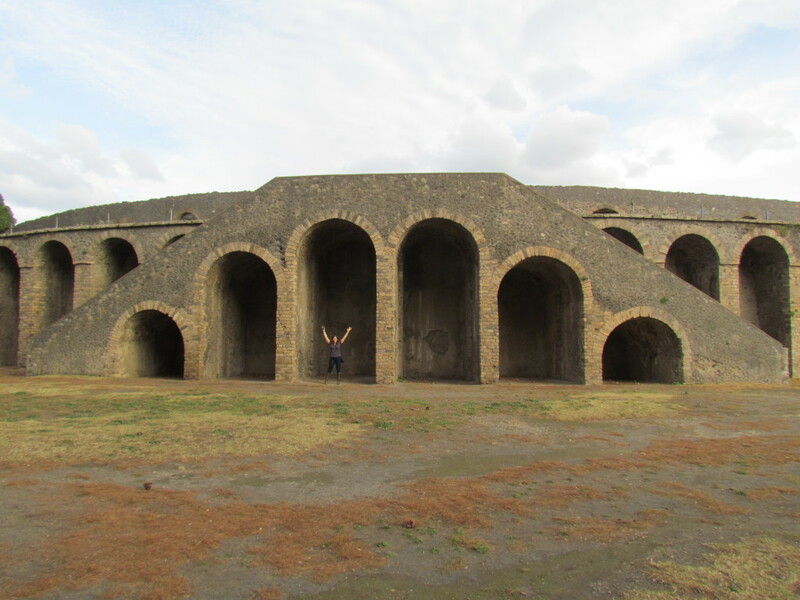 Pompeii surprised us with how large it was! It is a quarter of a square mile, but the outline of it is like a legit city, one with shops, public baths, brothels, bakeries and taverns, temples, theaters, a forum, and an amphitheater. 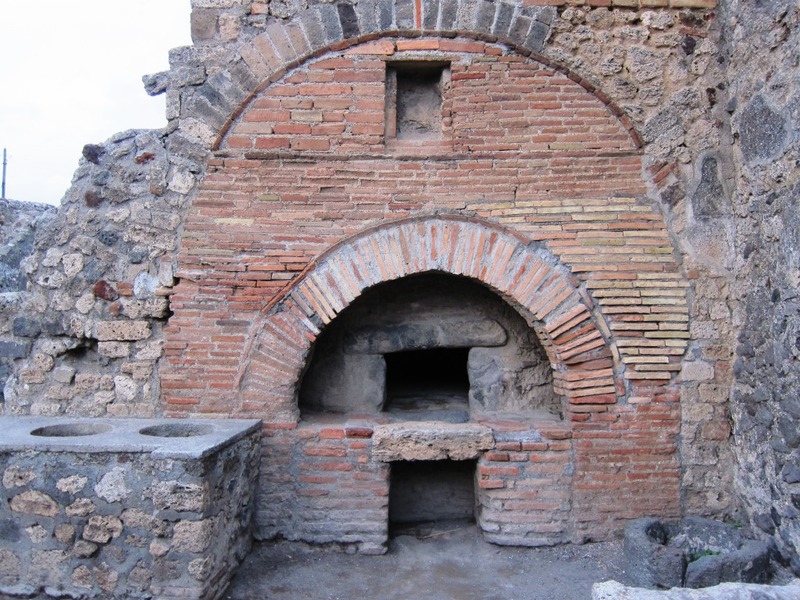 Pompeii had small houses for poorer/middle class families, and huge villas for richer families. 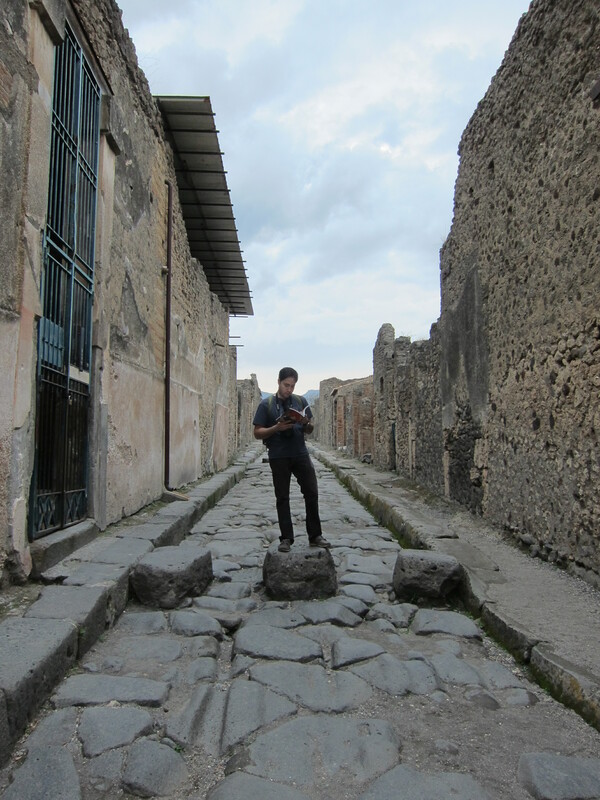 It was awesome walking around the streets and imagining what it was like there 2000 years ago. Boulders were put down so one can cross the street without stepping into the dirty street. The boulders were set far apart so that carts and other vehicles could pass. You can see the tracks from the carts in the paving of the street. 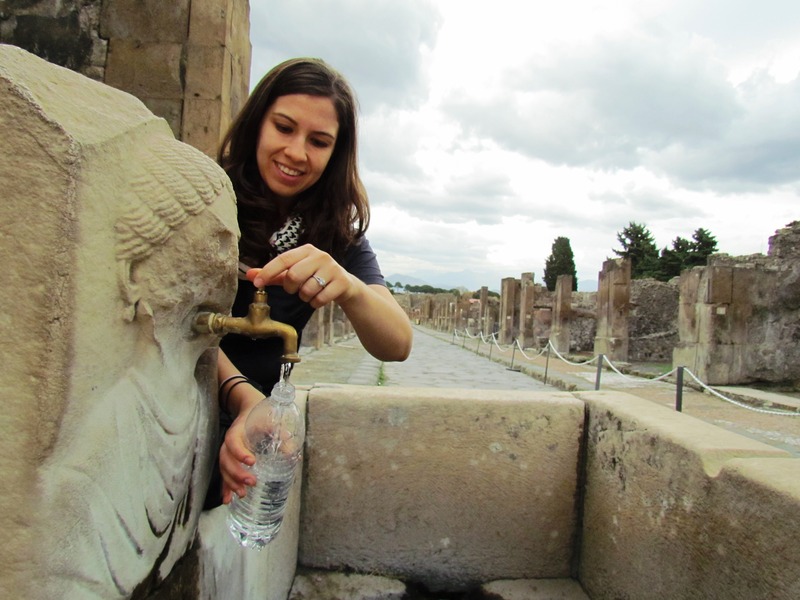 Pompeii had a pretty advanced water delivery system. 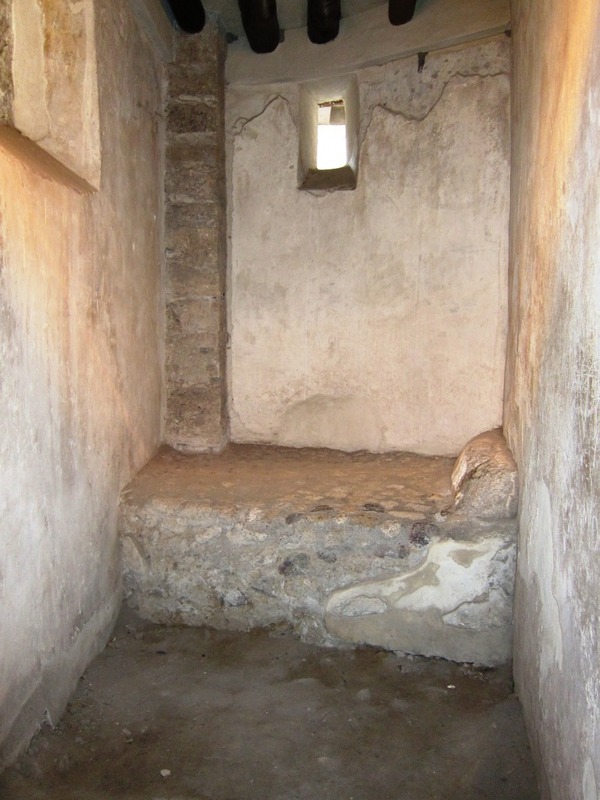 The water storage areas were set up in a way so that when there is a drought, the vital areas of the city still had water (the streets, the shops and restaurants) but the less important areas (the bath houses, individual houses) were the ones to go without water for a little while. We passed by some ruins of “cafeterias” or restaurants. They had counter-tops with big holes carved out in them. The coals went into the holes to keep the food warm. 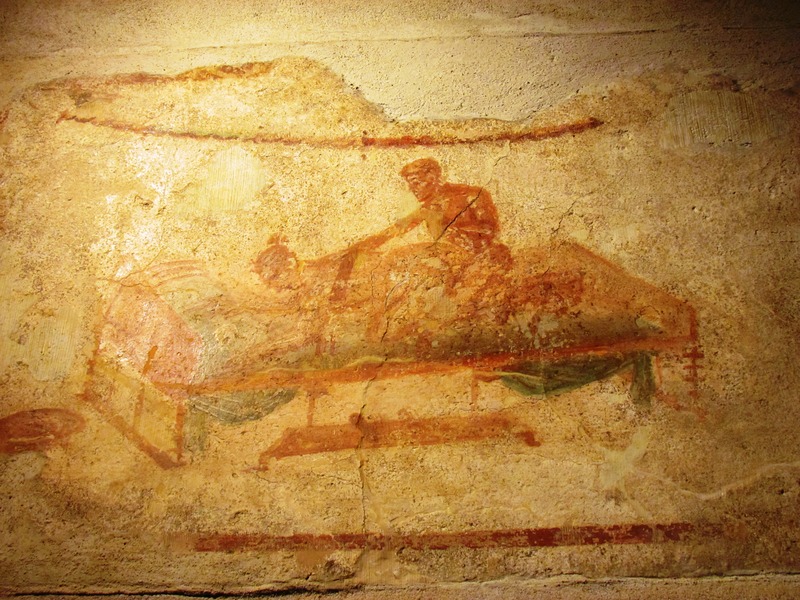 It turns out when the Romans got their food, they would go to the back of the cafeteria and recline on the beds in order to eat their foods – they didn’t eat sitting up or at a table. 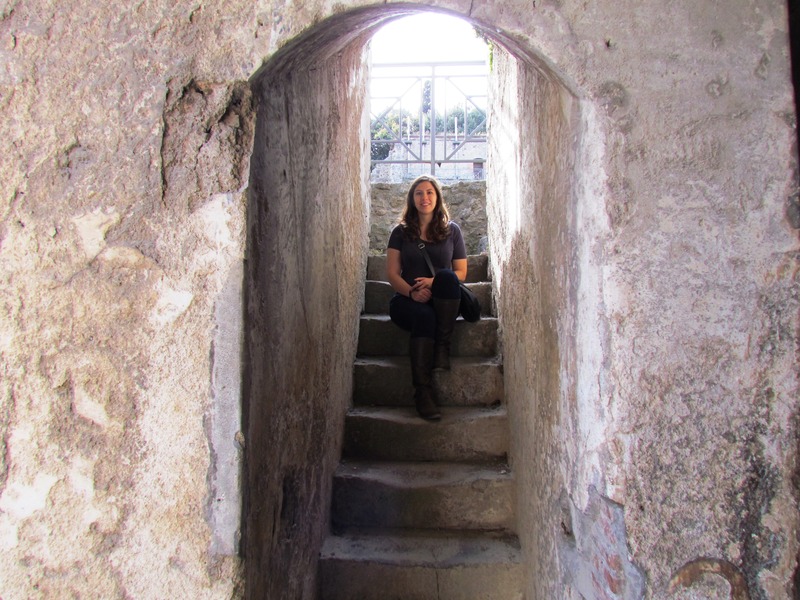 We went into the public bath houses, and were very impressed with the set up – they were changing rooms, cold, warm, and hot baths for both men and women, and a courtyard for socializing. 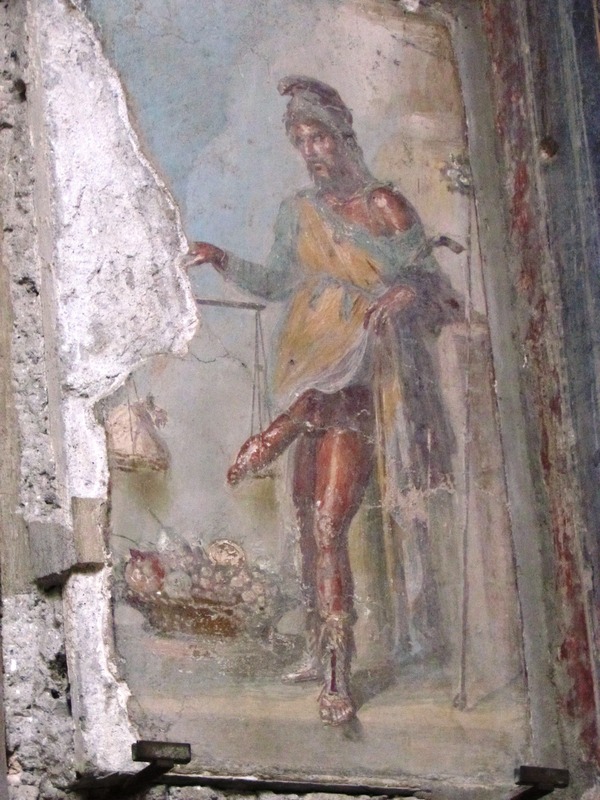 There was also a brothel in Pompeii, and the frescoes in the brothel had some pretty dirty images that were supposed to give suggestions on what to do and put the clientele in the right mood. 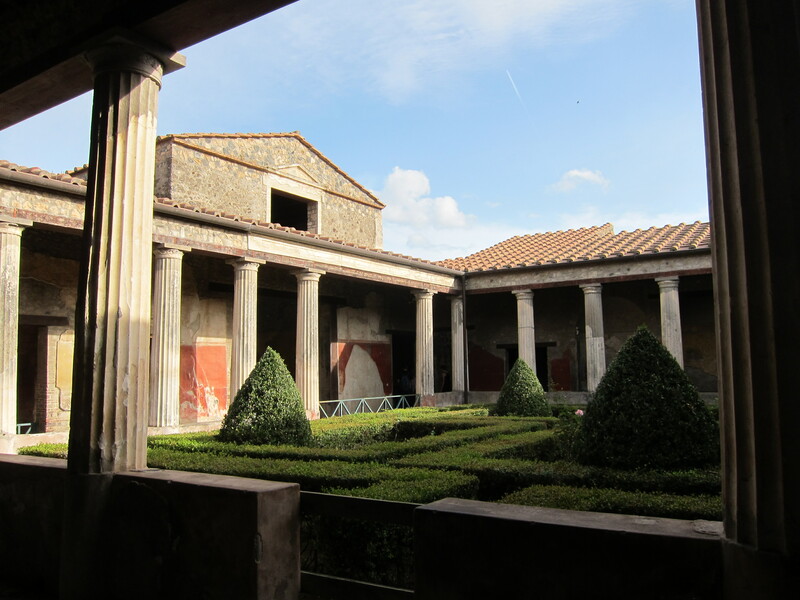 We enjoyed exploring some of the other wealthy people’s houses that had peristyles, gardens, mosaics, columns, and sculptures inside the houses. 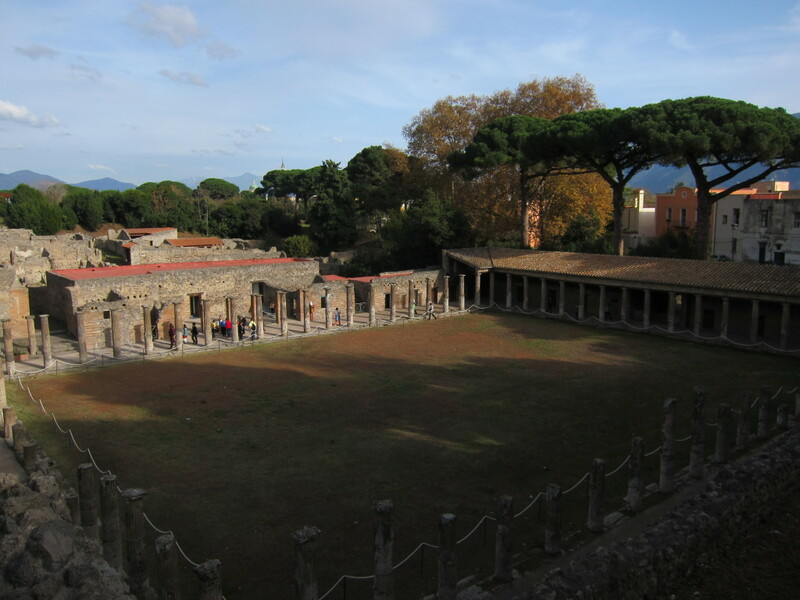 There were two theaters in Pompeii – the large and small theater, as well as the Amphitheater. 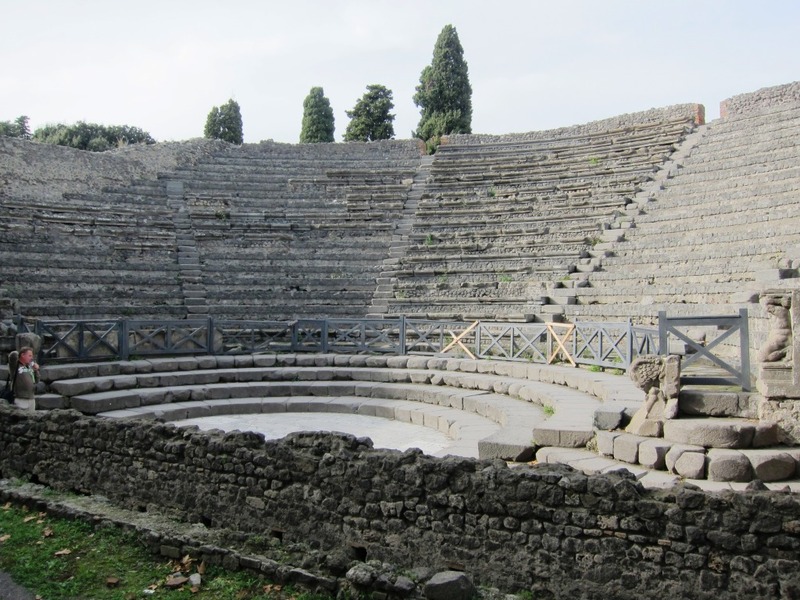 The large theater was built in the 2nd century BC, and could hold 5000 people. That’s crazy to think about, knowing it is so old! The theaters look kind of medieval in the pictures, but they were actually really nice back when they were built – they had marble statues all around the theater, and the seats in the front for the important people were also made out of marble. The area around the two theaters was really cool, with little narrow streets and passageways. The amphitheater was very impressive – such a huge building! 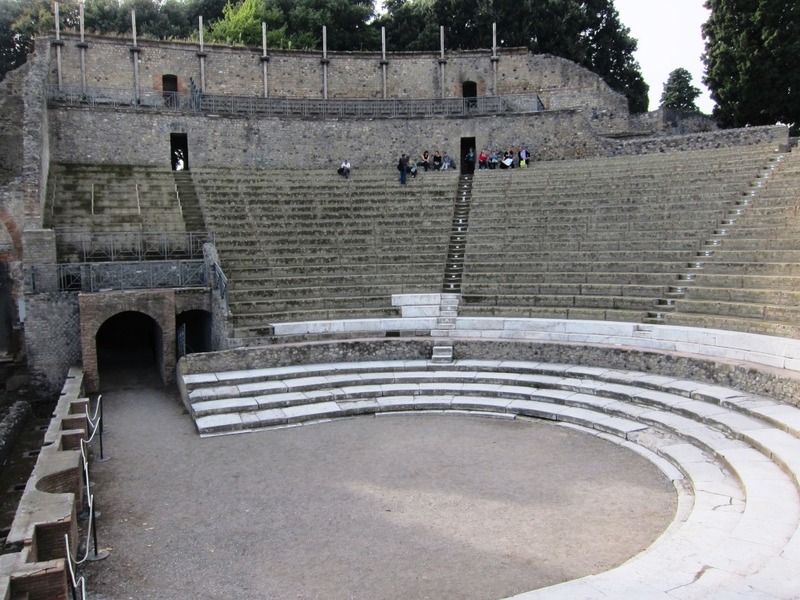 It is the oldest known amphitheater, built in 70BC. And it is a beautiful walk to get to the amphitheater, going through a tree-lined park and a beautiful open area. 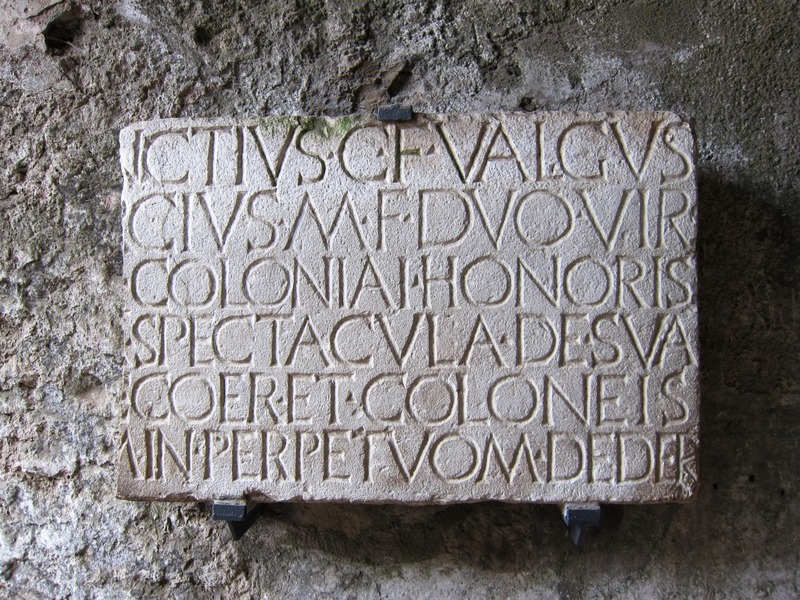 I wish I knew what this sign from the amphitheater said in Latin. 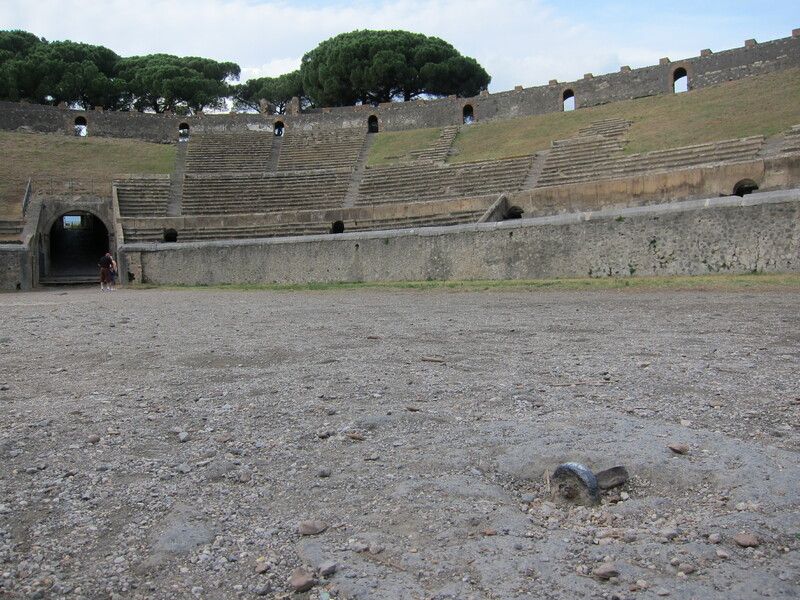 This stadium is where the athletes and fighters trained for fighting in the amphitheater. There was a huge forum at the entrance to the town, and near the forum there is a little storage area (you can’t really call it a museum) where they have a bunch of the artifacts that they discovered while excavating the site. It was eerie to see the outlines of the people and the dog. 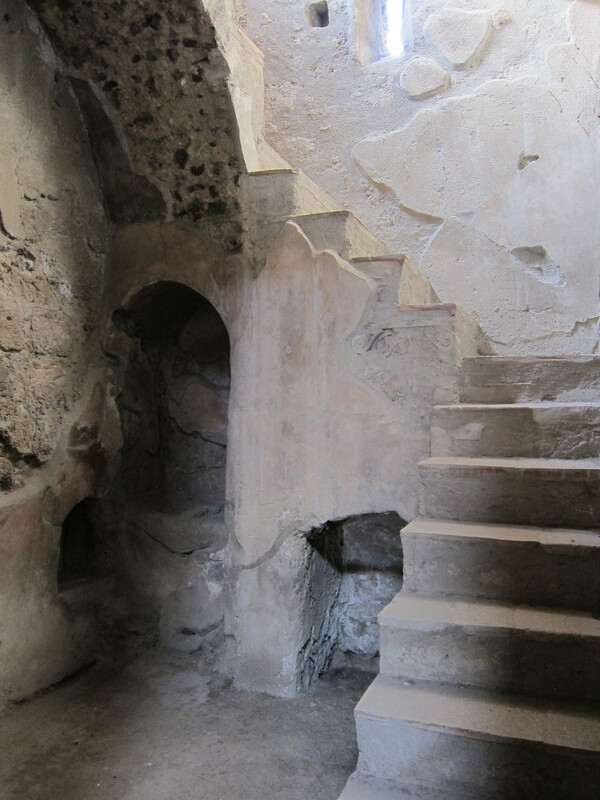 You can see the shape that the people took on as they died in a split second from the heat, and then were covered in ash for hundreds of years. 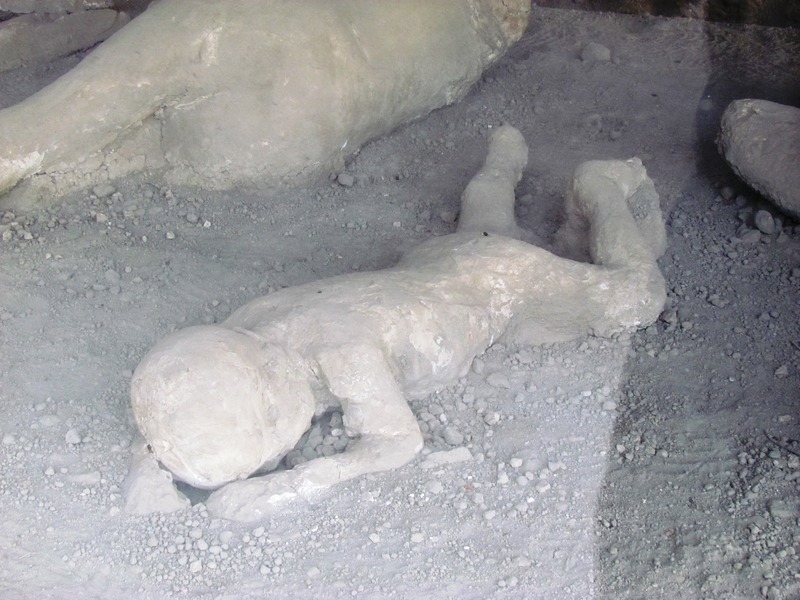 The people statues were made by injecting plaster into the holes that were left in the volcanic rock/petrified ash after the bodies decomposed. 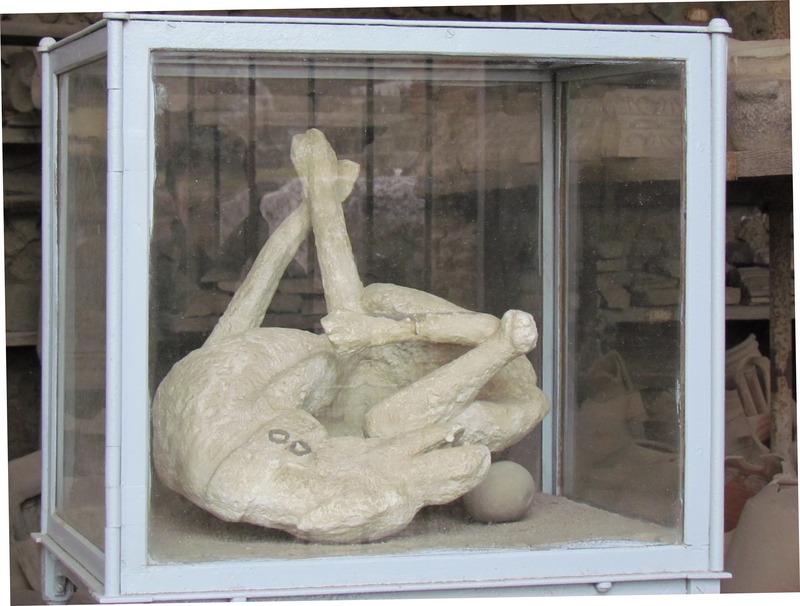 The plaster took on the shape of the bodies at the time of death and their clothes. We read that the bodies are twisted only because that is the body’s natural reaction to such a sudden change in temperature, but they actually died in a split second instead of suffering for a long time. We spent about 5 hours in Pompeii and still didn’t get to see every single street. 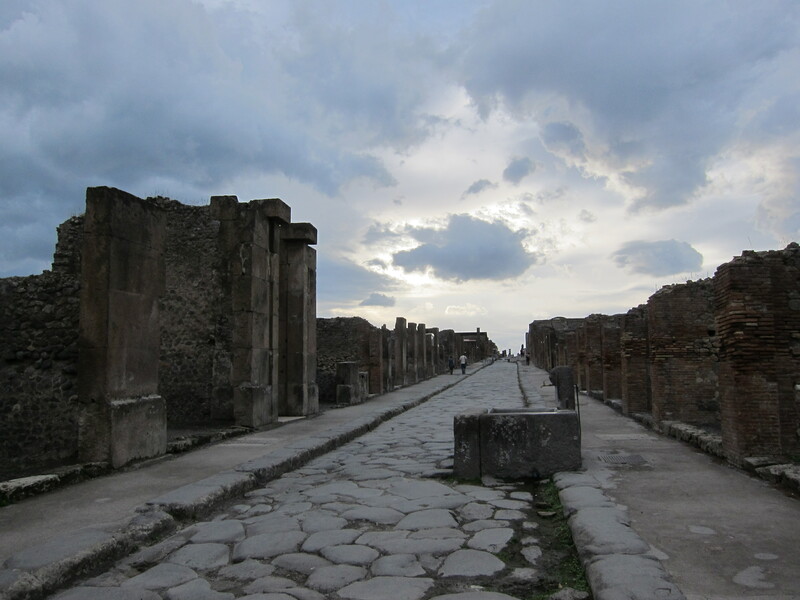 But there really is no need to see every street – it does get a bit repetitive walking around the ruins. We just stuck around because we like to explore every nook and cranny of a place, and we knew we probably wouldn’t be coming back ever. 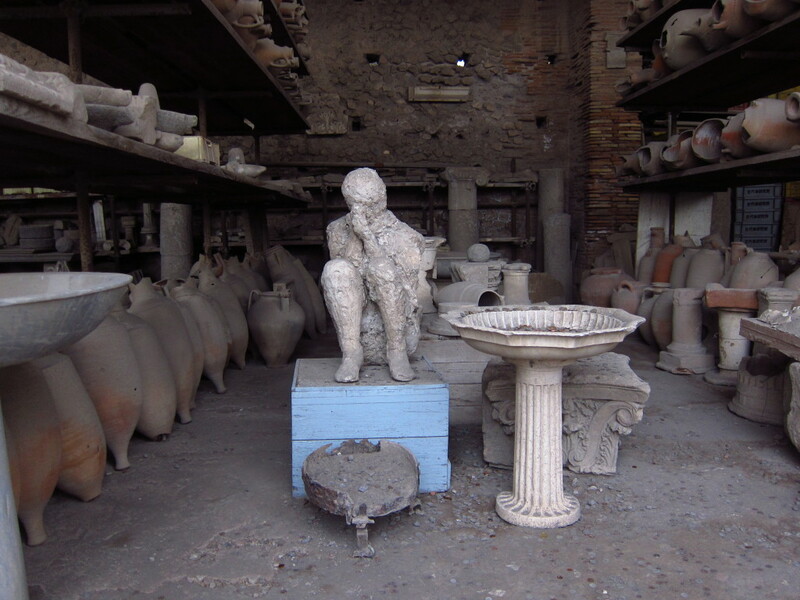 If you want to go to Pompeii, you can definitely do this trip in a half day if you walk quickly through the ruins. 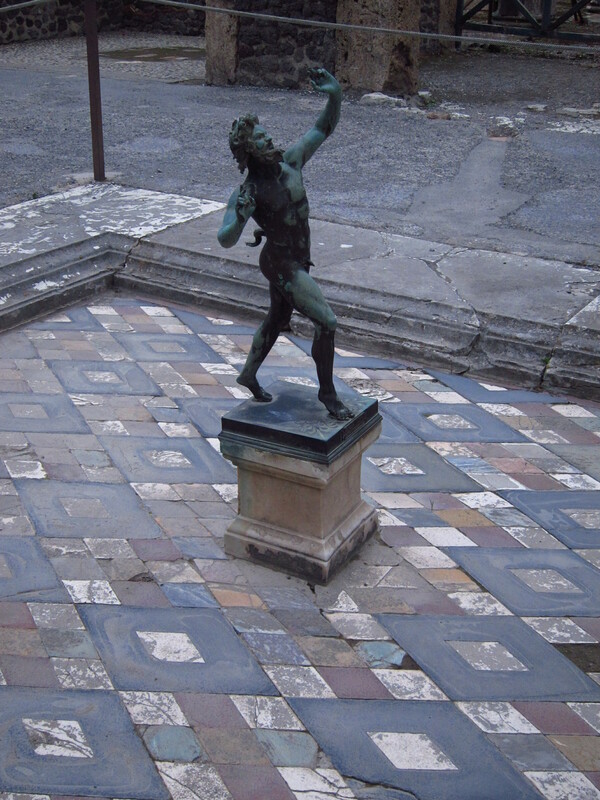 I would recommend going to the forum, the amphitheater, and the area around the two theaters if you are short on time. 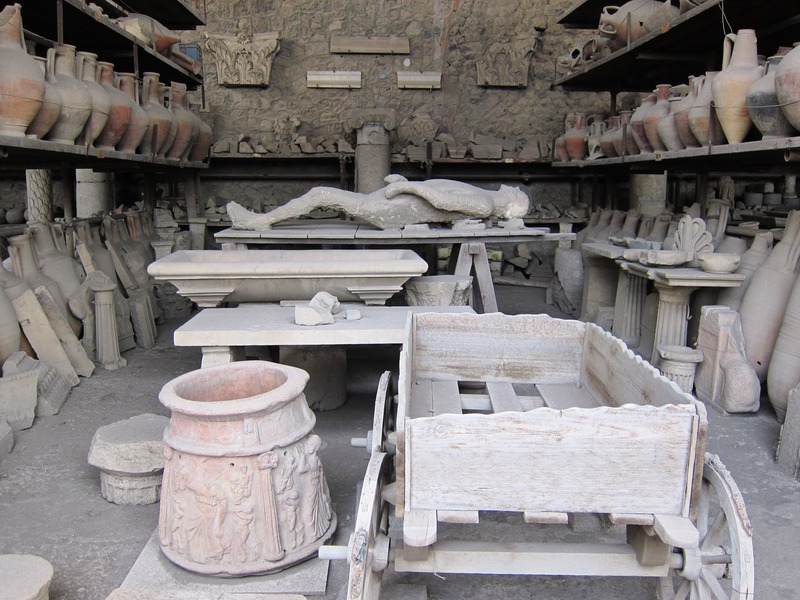 There is also a museum in Naples that has a lot of the frescoes and sculptures that were found in Pompeii, but I would skip the museum unless you are really into archaeology, Roman sculptures, or Pompeii because it really was not that interesting. 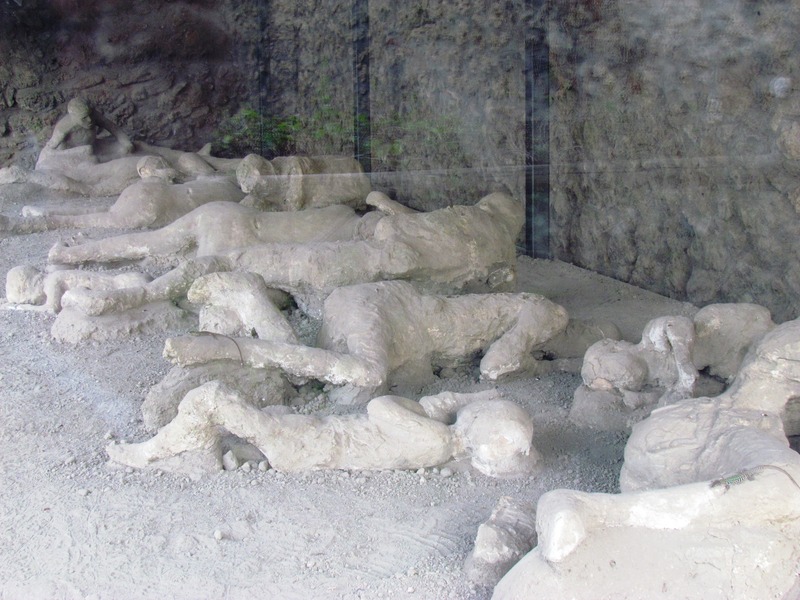 But Pompeii is absolutely worth the visit, to put yourself in the middle of this tragic story. 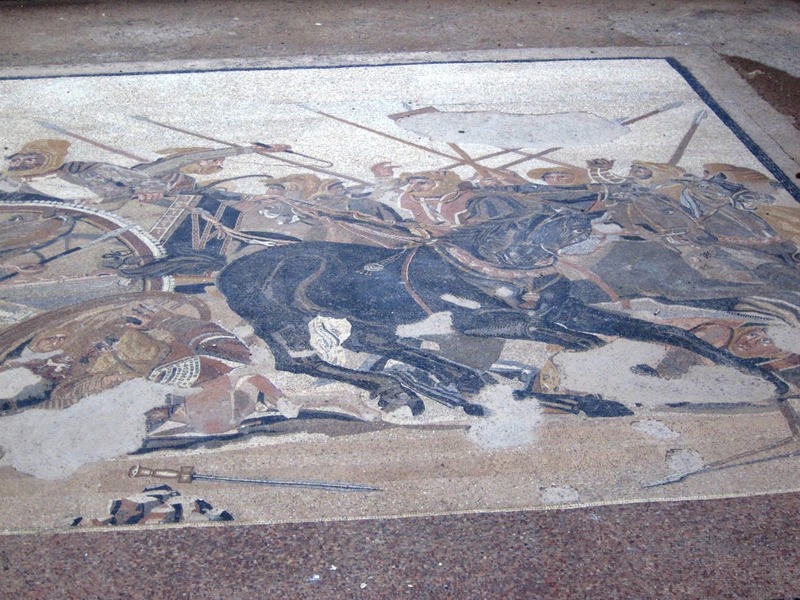 the image the the bed from a brothel in the exhibition? I sent you an e-mail in response to this comment.